Woohoo A Gambel's Quail nest and now BABIES!! Since this original post, I have become quite experienced in helping these families to make it and to end up all together in the end when they are ready to follow their parents. I have a couple who seem to nest there every spring. With no eggs lost. But, it is a hard life and hopefully more than a few will make it! I thought I'd post a picture of our successes and the Proud parents! Enjoy your bird watching, and when in doubt, always contact a bird expert! At the present time I am watching a pair of Loggerhead Shrikes as they nest. Nicked named, the little butcher bird. These bandits are very capable of protecting their nest and hatchlings! They are clever and have attitudes that don't quit! Nothing comes near their tree! Can't wait to share them with you all! Cindy, High Desert Mtns of So. Calif. Comments for Woohoo A Gambel's Quail nest and now BABIES!! Can somebody post a picture of what gamble quail eggs look like? I have Gambel's Quail eggs in my planter. I have a large beautiful Elephant Food plant in my pot. I water it sparingly each day, until two days in a row this Quail would fly out of the pot each time I watered. So since then I stopped watering the plant (hope it lives). Have I caused damage to the eggs? The babies will have a 3 foot drop to the brick pavers below. They also have a 6 inch climb to the rim of the pot. Should I put a ramp inside the pot? You're looking at about 2 weeks. Mom laid 15 eggs on April 18th. Sits on them quite regularly everyday. How long will it be before they hatch? Wanting to see the babies before they leave the nest. The female may have eaten the shells. Many birds either remove the shells or eat them. Snakes, they are everywhere and have a strong sense of smell. They leave no evidence of an attack. Where are the egg shells? One day the Quail eggs and mama were there and the next they were gone. The nest location was in a flower pot in an enclosed/gated courtyard. There is no evidence the nest was disturbed and I guess they all could have hatched and abandoned the nest but there were no egg shell remnants.If they did hatch where did the shells go? They all should be gone within two weeks. Appears to be what happened. Congratulations. We had quail babies hatch about two weeks ago. They were doing great, dad and mom were taking really good care of them. One week later, dad quail disappeared. A week later, mom and babies are nowhere to be seen. What's going on? Where did they go? Anyone know what's going on with quail population this year? I had one family of about 10-15 babies show up for feed & water. Parents are now down to 1 left. Have not seen anymore babies at all, with about 15-20 pairs coming for food & drink. Extremely concerned. A small female Gambel quail laid 8 eggs in our yard in a tomato plant pot and began incubating. Yesterday about a week into incubation my husband saw 2 adult quail on nest at midday with mama. At dusk mama was still sitting on nest. This morning we found her gone and also the eggs, but for a few tiny eggshell shards. Neighbors have warned us that we have a large bobcat in the area, not to mention rattlesnakes galore. We are sad they are gone and we do not even know what happened. QUAIL mom continues to sit on dead eggs help?? We found a nest of 10 quail eggs in our planter on our patio and 3 hatched after normal incubation period but died in the nest. Its been several months and the remaining 7 eggs have not hatched, and the mother continues to sit on them including the 3 dead ones. My plant is dead because I stopped watering it as I didn't want to disturb the nest. Im certain the 7 eggs are dead. Will she ever leave the Nest? What should I Do? I've had a water dish with a rock in the center on the ground since last Oct. for the quail, towees, thrashers, doves, etc. Unfortunately, I wasn't thinking about baby quail using it. They had been using a shallow glass pot lid I put out for them. A couple of days ago I went out to refill my water dish. It's been in the low 100's here & it evaporates very quickly. Anyway, the HORRIBLE NEWS is that I found 6 of the 12 baby quail floating dead in the dish. The water was too deep for them, over 1". My heart sank, broke & believe me I lost it! I immediately went out & bought a QUAIL FOUNTAIN at a farm store. It's the type with a small, red lid that screws on to a plastic container. Hard lesson learned! Baby birds can drown in 1"+ or - of water! Finding bird eggs This applies to any bird egg. Quail lay 1 egg each day until clutch is complete. Incubation begins after last egg or next to last is laid. So 10 to 15 days of laying eggs and then a couple of weeks of incubation. The young will be able to get out of most nest. Use common sense when it comes to keeping your dogs out of the nest. Too much activity around the nest site by dogs or humans may cause abandonment. Birds will decide if eggs are viable or not. They won't incubate forever. A lot of questions are being asked of quails leaving eggs in their yard .. this has happened to me as well .. I am not seeing an answer to anyone's questions. What do I do with these eggs it is sad. We found quail eggs in one of our plants in the backyard. 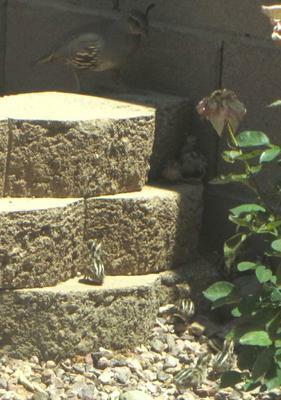 We think they were laid last week when we were on vacation and saw a quail go over our wall last night. Our dog discovered them when she nosed in the bush and grabbed an egg. Is there any chance that the mom will come back and take care of the rest of them, we put a fence around the plant. A quail has laid 9 eggs in my hanging basket of now dead flowers ( I finally stopped watering when mom was sticking around more) on my patio. She's ok with me walking around just sits still and quiet but I'm worried for the babies when they hatch....they are going to fall out to the cement...and my dog is going to kill them I'm sure. Can I move the basket somewhere safer, though I don't know where or maybe build "walls" to keep them in? I don't want mom to leave them! Have 15 eggs no mom she got scared away what do i do I've watered them by accident will they live do I leave them alone or what I feel bad. A quail laid eggs in my yard. How do I keep my dogs away from the baby's? Last year one dog killed a baby quail. 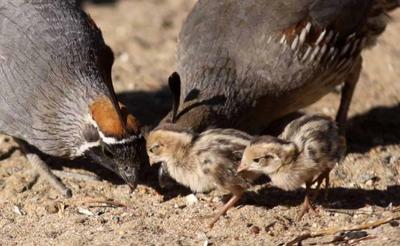 OH NO....Was this quail mom smart --or not? She made a nest in our portable fire pit that I had tossed dead branches intending to have a fire one night. Saw a big quail fly out suddenly and went over to see a nest at the bottom with 10-12 eggs. She was smart in that predators--like my nosey dog-will not be able to get near the eggs. Will the babies be able to get out to find food?? I will NOT be lighting any fires till they move out. Accidentally scared a quail who was nesting in a pot. She called all the hatched chicks out and they took off but still about 10 unhatched. Will the hen return and finish sitting on the unhatched eggs? Feeling bad. We have a quail family with 10-12 babies in our backyard wood pile. We have a dog and planned on removing the wood pile before they moved in. What do you suggest we do to keep them safe till they leave this home? Last year we had 11 eggs in a raised planter in the front of our house. King snake found the eggs and ate all of them. This year the nest is out back under a dense cactus but on the ground. This looks very vulnerable and we have 13 eggs so the hen is now in the 21 day gestation period. How would I protect this nest from snakes? I had 4 quail eggs in my geranium planter outside and this morning they were all gone!! The planter was tipped over and no evidence of anything left! I have a flower pot with 9 quail eggs. The mom has been sitting on them for almost a month in direct sun and 111+ temps. I am wondering if the eggs are still good. I can't imagine that they could survive the extreme temps. I have about 10 eggs in a pot on our patio, she has been laying on them for over a month, it is June 30th will these eggs hatch or are they dead? We have a quail nesting 10 eggs in a potted plant on our porch. She's been sitting on them since the 5th of May this is June 2. Does anyone know how long they will sit on them if they are not good Viable eggs that won't hatch? We thought we just had a dove nest in a hanging pot over our pool until a momma quail flew out too! We were concerned about them falling in our pool as the hanging pot is just a few feet from our pool so we moved the nest about 5 feet away on our wall completely protected from elements. The momma birds flew in and got close but wouldn't go in their nests so after a few hours we moved it back. The dove came back to the nest but left and the quail we have not seen again. It's been overnight. We won't do this again but is there any hope for the eggs? 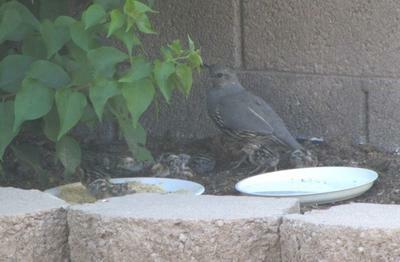 We had a momma quail and 11 eggs in a flower pot on our patio. A cat killed the momma quail sometime in the middle of the night. Is there any thing we can do to save the eggs. They are about 7 days old. A quail has laid eggs in our backyard and I just wanted to find out info on stressing a quail out. It is close to the garage and we also have a dog, so there is quite a bit of noise in the corner where she laid her eggs, and we want to make sure not to stress her out. anything helps. Thr greater roadrunner main quail egg snatcher! Unfortunately, the Greater Roadrunner is a big culprit for lost quail eggs, not to mention babies. They can get anywhere. Such is life. Sometimes very sad. Snakes are some of the best climber around. Purple Martin landlords put netting on their 15 foot poles to keep snakes from getting their birds. Snakes also have an incredible sense of smell. They leave no sign that they've attacked a nest. I doubt a snake would get up there, but sure am curious what animal could have taken 4 eggs away without breaking any. Seems so odd. Wonder if the quail will come back to lay more. Could be a snake, crows, grackles, raccoons or any number of other critters. I had 4 quail eggs in my cactus plant pot on our porch, and the next day they all just disappeared with no evidence of being eaten. Our porch is gated, but some animal could have jumped over I guess. Just so strange that there were no shells or anything showing a disturbance, like they just vanished. Anyone have any input on that? it's bugging the heck out of me! I like your suggestion, Cindy, thank you. It turns out that right after posting I read all I could find on quail behavior and found that the parents usually take chicks from the nest soon after birth, so I went ahead and did basically what you said - except without a box. I tilted the flower pot on its side and quickly went back into my house. Almost immediately, mom & dad came over to greet the chicks. The parents clucked and the babies squeaked, and within minutes, the family was proudly marching off through the desert, munching on seeds they found as they went. The next day, we saw what we believe was the same family, still intact and enjoying the delicious seeds that had fallen from the local trees this time of year. If this happens again, I'll probably use your suggestion of the box. Thank you. In the meantime, I'll re-pot my plant so the dirt is closer to the lip. If I were you, I would get a BIG box so that you don't lose any and tilt the pot putting them in the box. Get one big enough so that none can fall or escape out the sides of the pot and not in the box, then tilt except to go into the box. Then where ever you see the parents calling, set the box near but not too near to them and lay the box on its side. The babies will file out and when they do, the parents will call or come running to greet them provided you are not near it. 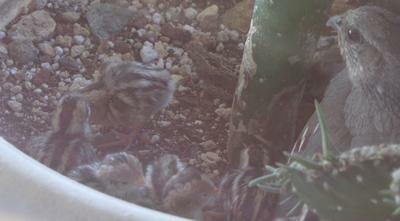 I have a flower pot (in Tucson) with four 2-3 day old quail hatchlings. The soil is 6" below the lip and the pot is three feet above a concrete slab. Yesterday, both parents seemed to be calling to the babies while pacing on the ground as if expecting the babies to leave the nest and join the parents. The chicks will not be able to climb out until they can fly. Shall I put the pot on the ground and tilt it so they're able to climb out? The parents are extremely attentive and always watch from a safe distance whenever I'm near the nest, so presumably they'd be ready to care for the chicks if they were to leave the flower pot. A quail set up a nest in my parents back yard problem is they have a small Jack Terrier that is not going to leave the nest or the future babies alone, do you have any suggestions?? All ten of our eggs hatched yesterday, and 24 hours later they were all running around the yard. I put out some starter mash and water about a week ago, and we've seen both parents and babies eating and drinking. We hope they'll stick around longer so they will have a better chance of survival. I've posted lots of photos and video on my Facebook page. Woohooo a Gambels Quail nest! A few years ago, we had a Quail pair, nesting on my patio in my brick flower planter. At either end of the planter are Rosemary bushes. The soil is moist most always there, and they're nesting right under one of the bushes. Same spot as the other pair did. The only problem, is.. When the chicks are ready to follow mom and dad, they can't get out of the planter! It sets about a foot to two feet down, and about three feet off the ground. Though the parents are smart for choosing such a location, they don't realize what's to come. With the last batch of chicks.. Mom and dad called feverishly to them, trying to get them to follow them on the ground. Their persistent cries alerted us. They could not get out. I called a wildlife bird rescue and asked what I could do. We rounded up all the babies.. SIXTEEN, corralled them into a box on its side and had to chase a few stragglers that we could not get into the box. Once we knew all sixteen were in the box, we slowly walked out into the yard where mom and dad were nervously watching and calling. We set the box down on its side near a bush, so they could pile out and then we quickly walked away. Sure enough!! Mom and Dad flew to them, gathered them up, and the happy family walked single file off into the yard.. under a new bush to call home. Oh boy, was it hard to catch those little things! And without hurting them! Like chasing chickens! It was quite an experience! Guess we'll be doing the same thing this time around too. I'll follow up, with nest pictures, eggs and then babies.. as soon as the blessed event happens! They are the CUTEST little babies.. Quail. Until they become teenagers.. then they sort of look like miniature turkeys with out head feathers! HA! Comments for Woohooo a Gambels Quail nest! There seems to be a bumper crop of quail babies this year in the High Desert of Socal, more than we have seen in 5 years. But the great majority, 70-80%, only have one parent. This is also a first. We cannot figure what has changed from other years to make this so. One single female had 30+ babies, obviously merged families. They move in total silence, the babies like a huge skirt around the mom. Where are the answers to these questions. Momma quail sits down on the eggs every day. About 2 weeks now. Will they likely hatch? To all of you concerned about the height from a gambel quail's nest to the ground, have no fear. I had a pair nest in the folaige covering the slatted top of my lanai. When they hatched, mom stayed on the ground clucking, and dad ran back and forth on the top of the lanai coaxing the babies. One by one they jumped off, landing on the WOOD floor of the lanai EIGHT feet below. I watched them kinda shake themselves a bit to regain their composure and then off they ran to join their clucking mother. I watched 8 babies in all and there were probably more before I saw what was going on. None of the babies appeared at all injured. I know also know of someone who lived on the second floor of an apartment. The quail nested in a flower pot on the back balcony. When they hatched they jumped off THIRTEEN feet, but there they landed on a pretty thick grassy lawn. You can bring the eggs to a wild bird rescue place or just and animal rescue. Call first. I had 19 eggs and mama didn't come around for about 4-5 days so we just brought the eggs to a rescue place in Scottsdale who said they would take them and put them on heat and hope that they hatch. Good luck! I have quail eggs in my fire pit.Looks like at least a dozen. I think mom took off though because my cat Dave discovered her hiding spot.I havent seen her in more than a week. She is usually there in the mornings, or was. Maybe I could turn them over to someone? I really think she abandoned the nest. One of our quails is laying in a VERY high off the ground cactus, perhaps 6 ft. up (it was a beautiful cactus wren's nest that now has 6 quail eggs). Two years ago one of our quail chose the flower pot outside our front door that was about two or so feet off the ground. When the babies hatched, it was wild. I finally went out and put the flower pot on the ground, resting sideways so the babies could get out. What is going to happen to these babies? Surely jumping from 6 or so feet has potential for them to be Kamikaze quail, dead on arrival ?? Thank you for your comments. Since I initially wrote my comments (around April 7) mama laid an egg each day until I left town on april 17. When I left, she had 18 or 19 eggs. She laid these eggs over more than a 2 week time span and she had not begun incubating her eggs before I left town. Due to my ignorance, I wasn't sure if that meant the eggs that were laid over 2 weeks prior were doomed. Hopefully all is well and when I get back to town she'll have begun incubating her eggs. I know these quail are a little infamous for laying eggs and then leaving them and so I wanted to try to help out if I could. We Have Quail Eggs Too!! We have a mama quail sitting on 10 eggs for about 10 days now - in the same place where we had babies hatch 3 years ago. 2-3 weeks ago we saw 2 eggs; then a few days later there were 3. A great article at http://www.azfcf.org/docs/DAC/Quail-Nest-Geraniums.Garrett.pdf explains how 8-30 eggs are laid over a few weeks before the mom begins to incubate them. Hatching is supposed to occur about 21 days after incubation states. This is in a plant pot that is about 3' above the ground. We'll put a fluffy towel below in case they hop out of the pot after hatching. Last time when I saw them beginning to leave, I put the pot on the ground and tipped it. I'll post photos if we're lucky enough to get them this time. Don't jump to conclusions just yet. These quail can lay between 9 and 14 eggs. Incubation doesn't begin until clutch is completed. It's a dangerous time as the eggs can be had by a predator. You'll have to wait until you know that no more eggs are being laid. Hi. I have a Gambel Quail nest in my backyard (inside the paddle cactus). I first noticed 5 eggs 3 days ago and as of yesterday afternoon, there are now 12 eggs. The Mom is not incubating her eggs, though. As a matter of fact, I haven't even see her since yesterday afternoon (early). I see the Dad perched on top of a cactus in the wash and he's making his calls. Where is the mom? Is it possible that she made another nest somewhere else and is sitting on that nest? Do they make multiple nests? Now I'm nervous that these quail eggs have been abandoned. Or is the mom just out and about? Is there something I should do or just leave it to nature? It breaks my heart, though, to think that these eggs might have been abandoned ( or could something have happened to the Mom? ), and if I can help I want to help. I don't want to just leave them there. Any suggestions or ideas? Thanks! I have had a quail nesting in my backyard for about 2 months. She sits there faithfully but still nothing. If the eggs aren' t viable will she leave? I feel so bad for her while she patiently waits. I left some pine cuttings in my wheel barrow waiting to get them into my garbage can. Tonight I went out to put some in my garbage can and in doing so, I noticed 10 eggs. I realized that earlier I mowed the lawn and bumped the wheel barrow a little. I didn't touch them but needed to get the wheel barrow off of the side walk so I just moved it into the flower garden about 2-3 ft away. I haven't seen the parents around tonight. I watered my grass which may have gotten them a little wet. I've been watching to see if the parents have returned but can't see anything and I don't want to get too close. Will they be okay? I have a nest of eggs in a planter which is outside my front door. The last time I had this a snake decided to invade the nest and it ended up eating all of the eggs. Is there anything I can do this time to prevent this from happening again. Obviously I cannot cover the top since the mother quail needs access to the eggs. I have 5 eggs so far. Thanks for your help. 3 mornings ago, 6 little quail chicks scurried in my yard, eventually after much cooing from the parents and help from mom, they ran under my gate to the front yard where I believe they ended up in the neighbors yard. Today, the babies had returned, and my dogs got to them. There were 3 this morning, one saved from my dog by my daughter. Then this afternoon, they came back again, and my puppy killed one. I was so heartbroken. The other survived and I did not find any others. Eventually momma showed up. I hoped she would guide her baby out. There were actually 4 adult quail on the wall when I went inside, I thought maybe a rescue plan! After dinner, I go to check..and there are 4 chicks and 2 grown ups! 2 families maybe? On approach they ran for the front gate and I followed so they would go out. I hate to do it, but they would surely be chew toys for my puppy and a hunting toy for my Jack Russell mix. If they could get in my neighbors yard, they would have better luck. So,before letting the dogs out tonight, I took the flash light out and made sure no baby quail were roaming around and sure enough momma and what looks like one baby are back and hunkered down by the wall in a pile of dirt. I'm not disturbing them, I will take the dogs out on leashes tonight for their final potties, but what if they are still there tomorrow??? Are they going to stay here? I am so worried about disturbing them, and causing their parents to abandon them. Can I water near a quail nest? I have a quail nest in a geranium plant. The mom sits there all the time. What should I do about giving the plant some water? I'm afraid I'll scare her away if I water, but don't want the plant to die. I suspect you have a Mourning Dove nest and not a quail nest. Try watering your plant slowly and away from the nest to keep it from getting wet. Don't soak the plant or the nest will wick up the water. The dove will fly away but most likely will return to incubating. Both male and female incubate the eggs. Hi! I stumbled across this page because I have a quail's nest out front and three of the eggs hatched but there appears the be a dead baby in the nest and the mom hasn't been in sight ever since the others hatched and left the nest. There are still 5 unhatched eggs. Is this normal? I have a quail family in my back yard. It is completely walled in, and only the parents can get on the wall. They come and go, checking on their babies. Will the babies be O.K. until they are big enough to fly to the top of the wall? There are lots of cactus, trees and bushes around the perimeter, should I give them anything? Awwww.. LAURA!!! I've been there done that!! I've had successful families under my Rosemary bushes under the same circumstances! What you did was a wonderful and instinctive thing, covered as much as you could with the rosemary branches. My thoughts are: (I am not a professional) If you leave the area alone, except for minor watering, the parents will continue on with their clutch. Do you hear them hollering in the background close by? The male will usually stand near-by, and call out off and on. Odds are that the female will resume her spot. I know we have had some warm weather though the nights have been chilly. Just watch from afar and hope that everything will go alright. It should! I have had to help them out in certain circumstances and we have always had a happy outcome! It is wonderful to see them with their young. I've gotten some really neat pictures of the families! Organ Pipe cactus. I took a picture while Mother bird was off the nest. Will all the eggs hatch (assuming all fertile) within a couple days. I know the quail lays only 1 egg per day, so would the last egg hatch soon after the 1st egg? I was just cleaning out my garden and cutting the out of control rosemary plant when I came across eggs at the base of the plant. I first jumped back thinking that they were lizard or snake eggs until I did some research. I had no idea that quail lay their eggs on the ground near bushy plants like rosemary. I quickly took a bunch of discarded rosemary branches and laid them on top of the eggs hoping that would help. I have checked the area a few times over the last 4 days and I don't see any quail tending to the eggs. Is it over for the eggs? Will the quails come back to this spot later this year or next? I just want to make sure that I don't repeat ruining a nesting area down the road. I feel terrible having come across them. I have had many quail families run through my yard and they always make me so happy. I doubt they will abandon them. Did you make sure that they could get back under the mower? 4-6 eggs, means she probably wasn't done laying all of them. Those eggs at that stage have to be incubated continuously though. On a really warm day.. it may not have hurt them for a short time. Odds are, that the female will just continue to be with them and lay more.. and hopefully her efforts will pay off. That's just my opinion.. I am not a professional. I wouldn't consider moving them though. Technically we are not supposed to interfere. I'm sure once they feel that no-one is in their area again, they will resume what they were doing. It is possible for them to abandon their nest... but not likely. The nest this year was under the lawn mower we keep on the side of the house in the gravel. Last weekend we discovered the quail nest because when we moved the lawn mower, a bird flew out. We mowed the lawn, covered the nest with a bucket while mowing and then put the lawn mower back on top the nest carefully. I am worried now that even thou we didn't touch the eggs or nest, we may have had caused them to abandon the nest. They are around in the tree but I don't see mom going under the mower to sit on the eggs. Last weekend here in AZ it was 70- 80 degrees but today and last night it was cold in the 60's. There's 5 or 6 eggs in the nest. Last year they were in the planter and we had about 14 babies. I loved every minute of watching them and had to help some out of the pot too. They tweet and dance and then scramble under the bush. I had a quail's nest in my flower pot in my window, so I had a perfect view to see the seven quail eggs as each one arrived daily. I've waiting for 23 days and they started to hatch today. We were planning an outing today and I was ready to cancel because I feared missing the baby quail. These posts implied that the babies stay in the nest for a while...at least a day. NOT ALWAYS. We returned three hours later and all were gone! They started hatching mid morning We were gone from 2-5 pm and they were out of the nest and no where to be seen upon our return. Had I not read this posting, I would have stayed home. So for those of you reading this, please realize that sometimes the mama quail moves the babes immediately after hatching. 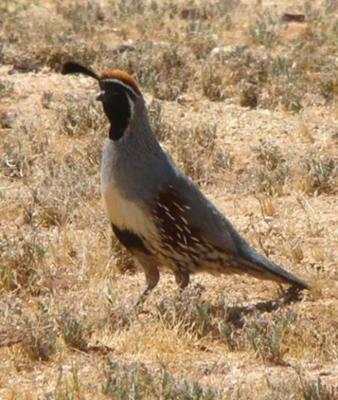 Sounds like your Quail family is doing great! have never heard or seen for that matter, the babies get on mom's back for a ride! And I've seen many a nesters.. and babies! I'm always learning! What a crazy instinct. Others might benefit from knowing this I am glad you posted. I think someone else on here.. was worried about their Quail babies getting out too. That just didn't happen with our families. We had to assist mom and dad in retrieving their young from our planter. We watched for a few days.. but knew they couldn't stay longer than that once they were ready to travel. Last year being a dryer year, I had only 6 quail eggs laid in a flower pot on my patio. This was a first for me so I had no idea of what to expect. Mama usually lays one egg a day till she decides how many is enough. Then, 21 to 22 days later, they hatch. During this time, dad is no where to be found but as soon as she wants help, she calls and he comes. The dirt in the pot was at least 8 inches below the top edge so I too wondered how they were going to get out. Didn't take long to find out. The babies get on the mom's back, she revs up her wings and flings them out. Like little balls of cotton they hit the ground and papa now has to keep them in tow till mama gets them all flung out. Then, the two of them take there little family out into the wild. This year we had 11 babies and mama is staying in the pot with the babies. This pot has a dripper that literally drips one drop every 2 seconds or so, so all drink the water and I have thrown in bread crumbs. That may account for why they haven't left. This year I have taken movie pictures of the event; drinking water, jumping on their mother's back and hopefully I will get the pictures of her launching them out. The babies were born 2 days ago. Wonderful news! Its is exciting and so neat to watch the Quail families. They face so many predators too. I hope many of your family survives. They are so adorable. Maybe being in your yard for a bit will help more survive. Just so glad you found my story helpful.. and had a wonderful turnout! Thank you for posting!!! Barely 24 hours after they hatch, Mom was encouraging them to try to get out of the plant pot. One struggled out to the next pot, then fell into the sheets I had bunched on the ground. I went outside and took the pot down and tipped it over, and all scurried out. So far they're still in our yard and we've spent countless hours watching through binoculars and taking video. It is endlessly entertaining. Watching them try to jump some of the bricks to get to Mom is hysterical. Dad spends most of his time sitting on the fence overlooking everything. It looks like 14 survived; not sure of one egg didn't hatch or if one perished later. Won't know until I can spend some time outside. I hope they stay in the yard for a while. Once they leave our backyard, the predators will be a concern. Yesterday I saw a Mom and only 4 babies out front. Thanks for your great site. Whoopie! Aren't they adorable? 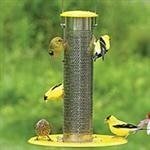 It probably wouldn't hurt to put a little seed in there, but that could bring unwanted birds to their home. When you see them feathered and running around.. it will probably be time for mom and Dad to have them on the ground with them. Keep your eye out! So glad you are enjoying this!! I sure did!! I am so sorry about what happened to your quail's nest. That is just what happens more times than not. What a horrific sight to have witnessed. I am so sorry. That would have killed me.. but too have to realize that its all a part of the eco system. I took pictures of one of my Roady's (Roadrunners out in the yard killing something for food.. and upon closer look after the shot with my zoom.. it was a fledgling Sparrow. It is so hard to see. Have you ever seen baby quail up close and personal? You probably have. hope your pair go out and try again.. and are then successful. I will add to this site by placing a picture of a mother quail and her babies.. calling it Wooohooo a gambles nest now babies! Oh and for the snakes.. it is their heat sensory tongue.. the Roadrunners just seem to KNOW where they go to nest. Snakes scare me to death.. and I have them all around my house. every now and then see a Roadrunner running with one in its mouth.. and its has always been a Mohave Green Rattler! So be kind to your Roadies! Everything's a purpose under the sun! They hatched yesterday afternoon. Still hanging in the plant pot. Looks like all hatched. Mom never strays far from the pot. Still haven't seen Dad. Mom notices every time we peek out of the window. I swear they've doubled in size in 24 hours. Our nest of 18 eggs didn't fare too well! We actually watched out our window the SNAKES eating the eggs. We were too late at saving them. Mom paced nearby and we had several Road Runners nearby. Think they had gotten a few individual eggs along the way. Had noticed that the count was down a few days earlier. I was initially upset that I wasn't able to protect them (think they were ready to hatch) but then remembered the laws of nature. My question is how do both snakes and roadrunners know where the eggs are? Has been an interesting adventure. Yes the male is probably hanging around out of sight. They never venture too far from the female while she is incubating! I am surprised you can't hear him hollering. They usually sit atop something from a distance and watch. When the babies are ready to leave the nest.. the dad will be right there with all of them and will defend them in every way! And they know who their mom and dad is!! They are so adorable when they are little tiny things.. just like little chicks. Best wishes for your Quail family's success! My quail nest has 15 eggs and is about 3 ft off the ground in one of my plant pots on the patio. It is right outside one of my great room windows, so we can check on mom several times a day. She has been on the eggs for 18 days that we know for sure, possibly a little longer. Does anyone know if the father bird usually hangs around before the eggs hatch? I'm worried that Mom is sitting on eggs that might not hatch if there is no Dad bird in the picture. We saw a pair of quail on the patio several days before I noticed the eggs, but haven't seen the male bird for more than two weeks. This is the first time in my yard, so I don't know what is normal, and haven't been able to find info yet one way or the other. Any words of advice will be welcome. Thanks. I share your concern. How deep is the planter from the dirt up? Are there sides around the planter at least a foot high? If that's the case.. they probably wont be able to jump up and over it, when they are ready to leave. Keep an eye on them. When they are running around the planter they are probably ready to go with the parents. Is there a way at that point that you can set the planter on the ground, when they are ready? Without knowing what your planter is like it is hard to say. What about placing some Lawn chair cushions around and underneath the planter.. maybe with a heavy rock at the ends.. so that it doesn't blow away, or get moved? I know it is very important to gather them all together at once.. as I was told into a box.. when you see mom and dad around calling to them.. and let them go where mom and dad are near. Somewhere in the open but preferably near a bush.. where they will gather.. till they hear their parents. the Parents need to see them though! I've not heard of Quail, laying eggs so far apart. Its usually only a few days till all are layed. As the babies are all the same age when ready to go. I think it was fourteen days for the incubation. And WOW eighteen!!! Lets hope they all make it. My planter is a blockwall about 3 feet high on one side and then an additional two foot wall paralleling it, closing off at the corners. the dirt for my flowers lay about a foot deep into the two walls. Snakes haven't gotten in there yet.. didn't with the other bunch.. but it doesn't mean it couldn't happen. They were very well hid under a Rosemary bush that sets one on either end of the planter. We have 18 gambel's quail eggs in our planter right next to our front door. The planter is at least 3 feet off the ground and if they hatch before the snakes find them, we too are concerned they will plunge to their death. Would placing towels on the ground around the pot help? We have a question about the length of this nesting. She layed an egg a day and this took about 2 weeks. The last 3 days she is staying in the pot on the eggs most of the night and part of the day; how much longer? Sure will be exciting to partake in these births! I hope your Quail babies do ok. A foot and a half off the ground probably wont hurt them. When they are ready.. do use a box.. if they stay trapped. That allows you to release all at once that that they all can see where mom or dad are going, and follow at the same time. Any stragglers will be vulnerable to predators. We did have to touch them to catch them and get them in the box. When they are running around the planter, they should be ready. And shouldn't stay in there to long after, or they will do without food. as mom wont be able to show them what to eat. I have the exact same problem!! My mom nested in my lettuce planter which is about a foot and a half off of the ground. I am so worried that the eggs will hatch when I'm not around and they will plunge to their death. I am hoping to help them down, but I'm not sure how to go about it. Why did you use the box? Is it bad to touch them? My original plan was just to put them on the ground with my hands. Is this not good? I am also worried because we have had an unexpected cold snap and it was raining on my planter and I ended up putting a tarp over the eggs, which mom didn't like. Now I think this was a mistake because it stressed her out even more, so I took the tarp down. Thanks for your post, I found it very helpful. Made it to the food and water! I live in the Phoenix, Arizona area. One day early in April, we saw a Gambel’s quail egg in a large plant pot on our patio, set up about three feet from the ground. Several days later I saw three eggs. After a little research I discovered the female lays one egg every day or two until she has between 8 and 20, then starts to incubate them. A little more research showed I could get “starter mash” from a feed store (they call it turkey starter mash and it’s priced reasonably) and that I should put out a little food and water during incubation so the parent quails would know where it was. We ended up with ten eggs in the pot, and all ten hatched on 4-28-13. The plant pot was situated by a window from our great room, so we were able to look in on the incubating female every day with minimal disturbance, peaking through the slats of the plantation shutters. When I noticed they had hatched, I checked on them often and was able to take videos through the slats. The next day we saw that the mom seemed to be urging the little ones to try to jump out of the pot. Then I noticed the male out in the yard – one of the first times we had seen for any length of time. A closer look showed us one of the little ones (only about an inch tall) had made it to the ground and the Dad was keeping an eye on him. I was worried about the three foot drop to the ground for the others, so I went onto the patio to bring the pot to the ground and tip it sideways so the little ones could run out. They made lots of noises, and the male and female did their best to distract us with lots of wing flapping and calling out. We left the patio quickly and continued to watch them from the windows. We knew the mortality rate of baby quail was pretty high, so we did what we could to increase their chances of survival (we had 14 hatch in 2010 that left the yard after two and a half days, and the next day we we saw them in the front of the yard, there was only five left). I continued to put out food and water every day (when they were at the opposite side of the yard) and we blocked the bottom of the gate so they would stay confined to the backyard longer. We spent many hours every day just watching them through our sliding door. It was such great entertainment and so amazing to watch. The male spent most of his time walking back and forth across the block wall at the back of the yard, while the female herded the little ones back and forth from west to east and back again. At both back corners of the yard, we have raised planters (about a foot high, made with 4" stacking bricks) with bougainvillea growing in them. One of the food and water stations was in the west planter where we could easily see it from the sliding door. It was so comical to see the little ones running back and forth. Following the mom, they would run a little ways, then stop to scratch up something from under the rose bushes. Then they would take off again and there was always one little one left behind who would look up, see he was alone, and take off running. You could almost see the bubble above its head saying “Hey, wait for me!” It was also funny to watch them trying to follow the female up into that raised planter. They tried so hard, but at two days old, they could barely hop up four inches of the brick to get to the next level, but quickly learned that was how to get to the food and water. We believe they spent their nights under the bougainvillea. By looking at videos we had taken, we could see there were ten babies the first few days; by the third or fourth day, we could see there were only nine. By the time they were a week old, you could see their feathers beginning to develop a little, and they were able to fly close to the ground for a foot or so, and were able to fly down from the raised planter the one foot to the main yard. Soon we could see they were flying up the one foot and didn’t need to hop up from brick to brick any longer. The morning they were two weeks old, I looked out and saw the male and five of the little ones running around as usual. Coming home a few hours later from running errands, my husband confirmed that was all he had seen. The female and four of the little ones were gone. We watched closely off and on all day hoping to see them again. Late in the afternoon while I was watching, I was astonished to see one of the little ones fly from the raised planter all the way up to the top of the wall (around six feet up) where the male was. A minute or two later, another one made it to the top of the wall (barely). The other three were frantic down in the yard, but even though they tried very hard, they couldn’t make it to the top. They tried flying half way up the bougainvillea and take off from there, but the perch was too wobbly for them to make it. The two on the wall with the male flew down into the yard behind us. We thought that was the last we’d see of them, and also assumed that was what had happened to the other four and the female – that they were all trying to get together somewhere else. We figured we were lucky to have been able to watch them for two whole weeks this time. Just before dark we saw there were still three little ones in the yard. We were astonished the next morning to see the male and all five of the little ones back in the yard. By this time, the “babies” were at least 2" tall. I continued putting out food and water for another week (and water only after that), and we were rewarded to see the male and babies every day at different times. After several days there were only four little ones. and after about two more weeks, there were only three. Today is nine weeks since they hatched, and I’m thrilled to say the male and what we call “the three amigos” come to the yard every day. I have continued to put out water every day; twice a day since our temperatures have been averaging 115 the past week or two. We sometimes see them early in the morning, but can count on seeing them every evening between five and seven. They are nearly as large as the male now, and using the binoculars, we are pretty sure we can tell that two are males and the other is female. The dark feathers on the head are becoming very evident on two of them. Their topknots still look like a teenager with spiky hair. It has been a joy to us and gives us hope they will be back next spring to hatch their own broods. We never saw the female again after the two week mark. I have always thought the family unit stays together, so we have to assume something happened to her and the other babies. We have also had some visits from other male and female pairs at various times. When the chicks were little, “our” male confronted the others with lots of chest bumping and feathers flying if they got too close to his brood. I have attached a few photos. The first one is when they are a few hours old and still in the plant pot. The second one shows them trying so hard to get up to where the female is. The third shows them by the food and water by the bougainvillea, and the last one shows the male and “three amigos” from about three weeks ago. They are much bigger now, and still giving us such pleasure every day. We have a mama quail that laid her first egg on May 1st and within several days laid 6 additional. She did leave her nest for over 24 hours in the beginning but has been sitting on the seven eggs in a pot near our front door since approximately May 6, 2018. She leaves every once in a while but keeps coming back. It's June 10th today. Is there still a chance that her eggs will hatch at this point?? 35 days and no sign of hatching. Answering your question about abandoned babies. No. The parents lead them. Those that can't follow are left to die. The parents will usually wait for a long time, however. If there are lots of babies in the area, mom and dad are probably on the other side of a wall or searching for a way to keep the covey on the move. Leave the babies alone. If they are still there the next day, you could have an abandonment issue. Quite a few baby quail , just a few hours old, ended up in my backyard. I have no idea where they came from, I seen no sign of mama or a nest. My dogs caught 3 of them and unfortunately killed them before I could save them. I did find two more and put them under a chick heater, so they would have a chance of survival. if I take them back out in the morning, will the mama hear them calling and come for them? I feel so bad! Help if anyone knows!